Def Leppard drummer Rick Allen was interviewed during the Monsters Of Rock cruise and the full audio is available. 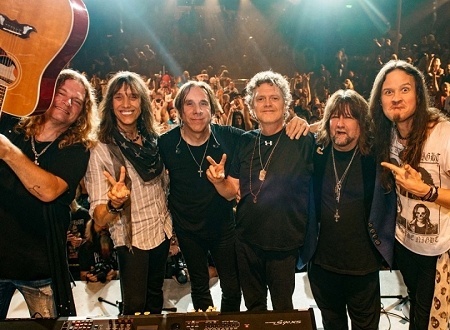 Rick spoke to Eddie Trunk for an interview alongside Jeff Keith from Tesla during the recent Monsters Of Rock cruise. He also appeared on stage with Tesla during two of their shows. 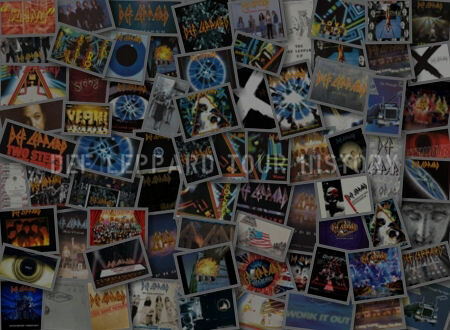 Rick talked about the 2018 North American tour with Journey, 2006 tour, Hysteria tour with Tesla, the laundry baskets, Steve Clark/Robert Plant story, Tesla recording story, meeting Tesla, Phil Collen produced Tesla album, being vegans, a second Def Leppard cruise, Jeff's early days, Rick's artwork, Tesla tour, Mushrooms story and Rick's drumming. 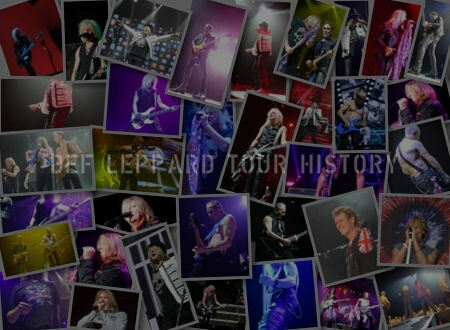 He said he would be up for doing another Def Leppard cruise after having enjoyed the Monsters Of Rock cruise last week. Listen to the full 46 minute interview below. Rick - "It was great the last time and, you know, just a really good camaraderie between the two bands and I think it's gonna be really fun you know. Hearing that many hit songs, you know, all in one night. ."
Rick - "You just reminded me of a great story. So I would come out with a wig on. A big old baseball cap. One of those big red cups full of beer and then I had a mannequin arm, the whole nine yards. A crew jacket on. Crew pass and so this one night I'm about to go out to the stage and Steve Clark comes up to me and he goes, he gives me a big old pat on the back. He says have a great night Rick. And he stuck this thing on my back that says I'm Rick Allen. So I'm going through the crowd like checking everybody out you know. And I'm about ten feet from the stage and this kid comes up and he goes Rick Allen man!. ." Jeff - "It was a blast. It was a blast I mean Rick you know better than anyone. 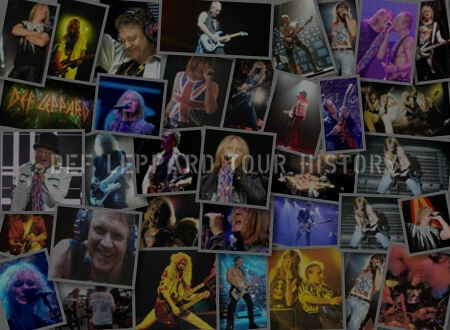 These guys man all they've done for us Def Leppard, but they're just awesome people and I mean that. No, I mean that. They took us under their wing and taught us how to treat bands that are playing with you. You know you guys taught us man it's the whole entire show is, that's what it's all about." Jeff - "So they've always been great to us. So Phil Collen is a great super good, Phil's such a great guy man and we loved working with him. He really got some really good stuff out of us. He even helped co-write it with us." Jeff - "Absolutely. He even co-wrote with us." Rick - "We used to all do this warm up tape and he started getting Jeff into doing the warm up tape. And it just opened his throat up. I mean it really changed his range and just the quality of his voice. 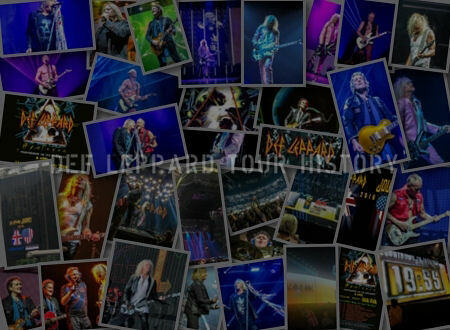 So, you know, hang out with Def Leppard, look what happens!." Rick - "So I take it you guys have both had a good time on the boat, 'cause I've had a great time. I wish it was like this on the Def Leppard cruise, 'cause the Def Leppard cruise it was really rough. You know like obviously Jimmy. It was just one thing after the next and I think if everybody had of had this kind of experience. I think we'd be doing another one." Rick - "I'm totally open to it and everybody's been really respectful. I've been wandering around the boat, you know, doing pop up sort of...everybody's been really cool." Rick - "I hope so. I just think if Joe and the guys had of had this kind of experience. I think it would have just been a lot smoother transition to do another one."